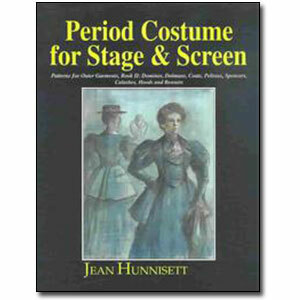 Period Costume For Stage And Screen is a comprehensive guide to creating period dress. It consists of a series of books detailing the construction of garments, undergarments, and outergarments. The main thrust is women's dress, but in several periods, some of the garments are applicable to both men's and women's costumes and there are also specific items of men's wear described and patterned. As well as being accurate, Jean Hunnisett's patterns have been prepared so that they can be readily made up using today's fabrics and sewing methods, and fit the modern female figure. This is the second book in this series concentrating on outer garments. The first book covered — Cloaks, Capes, Stoles and Wadded Mantles. This book deals with — Dominos, Hoods, Coats, Pelises, Spencers, Calashes, Hoods, and Bonnets. It is abundantly illustrated by drawings and photographs and includes scaled patterns. Whether you are an amateur, a student, or a professional costumer, the book, and the series it belongs to, is an invaluable source of patterns and techniques. Jean Hunnisett (1930-2003) was an internationally famous costumer. Her skills as a costume maker were extremely well-known in Great Britain, where she ran her own freelance costume business as well as taught and designed. She cut and made costumes for 30 years for all the major opera and ballet companies as well as West End productions. She noted the bulk of her work during that period was for television, mainly the BBC. She made costumes for 27 plays, 48 series or serials, 10 operas, and nine adaptations in the BBC Shakespeare series. In North America, she was probably best known for the texts she developed while teaching weekend courses for the Association of British Theatre Technicians and a Period Costume Cutting Course for ILEA.